In this salsa we are going to use one of the most important ingredients that the Mexican cuisine has given to the world “the tomato". – The Spaniards named it tomatillo, being the most similar word to the Nahuatl “tomatl". When they arrived to Europe the Italians named it pomo-doro, may be because the first tomatoes that arrive were yellow like the gold. For this reason when someone thinks in tomato salsa, one automatically thinks in Italy and their delicious pastas with tomato salsa. Well, these dishes can also be adapted to a Mexican version and that change is made by using the Mexican style tomato salsa and just as it may be expected this salsa will be spicy. In the Mexican style tomato salsa the flavor of the chili with spices is incorporated, which are fused in an exquisite way with the tomato’s flavor – the flavor and the aroma of this salsa are really unique . This salsa is mainly use to cook chicken , fish or pasta. Although you can also use it to place it on the table center and it can be put on tortilla chips , tostadas , fried potato tacos and even to bread with some olive oil. 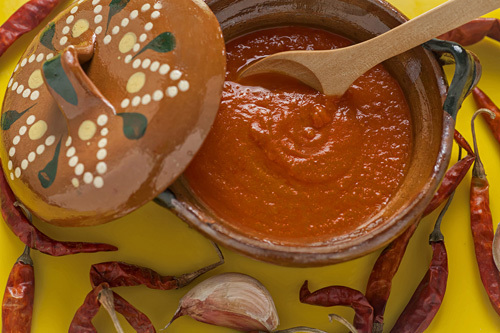 To prepare the salsa you have to cook and blend ingredients, tasks that are very easy to perform. This salsa is incredible because it is prepared with some sugar to balance tomato’s acidity. We give the recipe with dried oregano and thyme although they could also be used fresh, just adjust to 1 sprig of each one. Remove the seeds and the veins of 3 arbol peppers. By removing the seeds and the veins of the arbol peppers, the tomato salsa will have a better texture. The 3 Arbol Peppers with the ones you worked. Bring the saucepan water to a boil over high heat and leave the ingredients cooking in the boiling water for about 5 minutes, until the chilies soften and change to a paler color. * After trying this salsa you will no longer be able to buy canned salsas. Variation: We already know that you like the tomato salsas therefore make sure to prepare the tomato brothy. Did you like the Tomato Salsa? ༅ Mexican Food with Maize. Use these arbol peppers to make the salsa because they will give a very good color and flavor. Try the organic thyme and get amazed with its flavor.